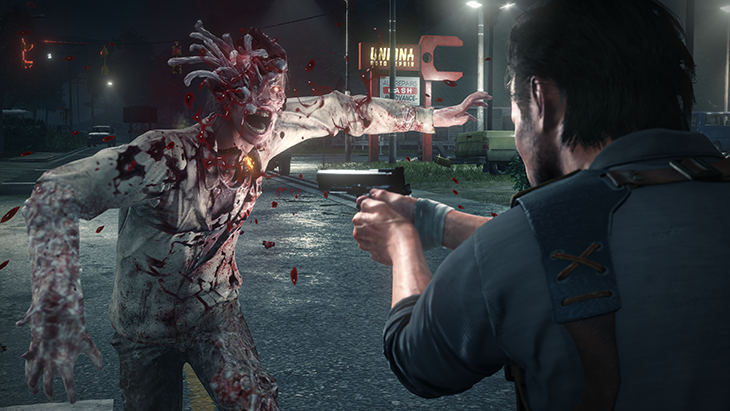 High-octane survival horror game The Evil Within 2 is going to feature an altered upgrade and customization system from the first game. In an interview with Tango Gameworks developers, we’ve got some details on the new mechanics that will help you survive the nightmare! Some of these changes seem to have RPG influences in them, which should give combat a personal twist. First off, the Green Gel that was required to upgrade anything in the original game has been changed – the gel is now only used for Sebastian’s personal upgrades. Sebastian’s upgrades are divided into different trees, each one suited to a different aspect, such as Health, Stealth, Combat, Recovery, and Athleticism. These upgrade trees are fairly straightforward, like the Health tree making Sebastian sturdier by increasing his maximum health and the Stealth tree allowing stealth kills from cover. Some upgrade trees will even grant Sebastian active skills, like the Combat Tree’s “Bullet Cascade,” which temporarily increases bullet damage with each consecutive shot. Throughout your journey you’ll come across Weapon Parts that you can use to customize your guns and other weapons. You’ll be able to tweak things like firepower, ammo capacity, reload time, and so forth. The Warden Crossbow, however, has its own set of upgrades, but you’ll still need Weapon Parts for it. It’s seemingly the successor to the Agony Crossbow from the original game, so expect to see new types of bolts for it. You’ll be able to increase the speed at which the crossbow loads bolts, increase the range, and of course increase damage. Specific types of bolts will also have their own specialized upgrades, so if you prefer one type of bolt over the other you’ll have plenty to work with. In addition to the reworked skill and weapon customization systems, the crafting system is also getting slightly changed. You’ll be able to scavenge for materials in the world and take them back to workbenches. Here you can craft those materials into more ammo or health supplies. You can also opt to craft without a workbench in case of emergency, but this is much more costly. The Evil Within 2 will launch October 13, 2017 for the PC, Xbox One, and PlayStation 4.